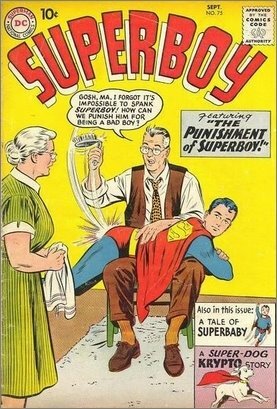 Silver Age Comics: Spanking your super kids, a great reason for Superman not to marry, and Cluck Kent! And we still hate Lucy Lane. So Superman spotted the trouble from … (Wait for it) … ANOTHER GALAXY???!!! Just how the hell fast is Superman, anyway? Even if he’s talking about Andromeda, the closest galaxy to Earth, that’s 2.5 MILLION light-years away. In other words, it would take two and a half million years traveling at the SPEED OF LIGHT to get there! 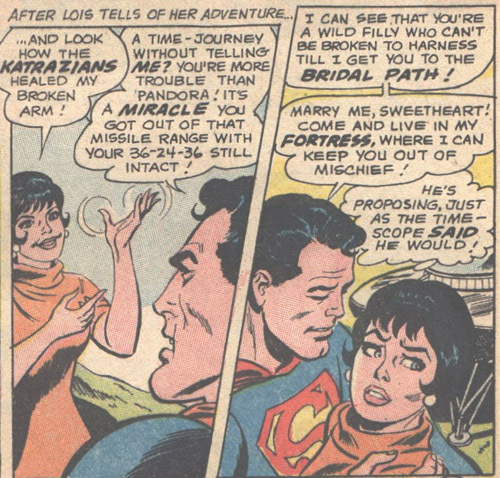 And Superman just happened to check in on Earth with his super vision (which also must travel faster than light) and saw Supergirl’s troubles and raced back in a few seconds from ANOTHER GALAXY? And exactly what is so important in ANOTHER GALAXY that Superman goes there, anyway? Look, we know the Silver Age was ridiculous but this is going about 2.5 million times too far! These pictures are just so wrong on so many levels. I always get a kick out of how Ma and Pa Kent can forget that their son is invulnerable. As if the costume, the rocket ship, the flying, the bullets bouncing off, surviving explosions, etc, wasn’t enough of a clue. Why would Pa ever need to punish Clark? Any silver age story had Clark as a PERFECT child. What did he do that was so bad, accidentally knock Jupiter out of orbit? Tell him he’s grounded, no trips to the 30th century for one week. Force him to go on a date. With a girl. 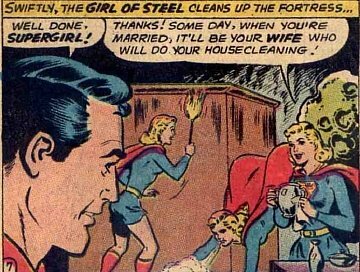 Aw, what a nice reason for Superman to get married. So someone can do his housecleaning. In his gigantic fortress. At the North Pole. Revealed: The lost “Mad Men” Superman script. 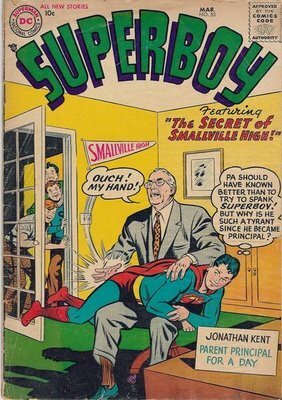 Finally, an exciting preview of Smallville, Season 9! I assume that because Jimmy is wearing Mr. Mxyzptlk’s hat he has the imp’s powers and is being a real jerk. So he turns “Cluck” Kent turned into a chicken (literally), Lois made into some futuristic super-mutant. And people thought “Superman III” was bad. Strangely, all I can think of is is how much I hate Lucy Lane. She ALWAYS wore that flight attendant uniform — I mean, always. With the little hat and everything. She always had that look of disapproval on her face and was always chastising Jimmy. OK, Clark with a chicken-head is frackking HILARIOUS. Now THAT’s how Ma and Pa Kent could punish Superboy — have Mr. Mxyzptlk turn him into a chicken.